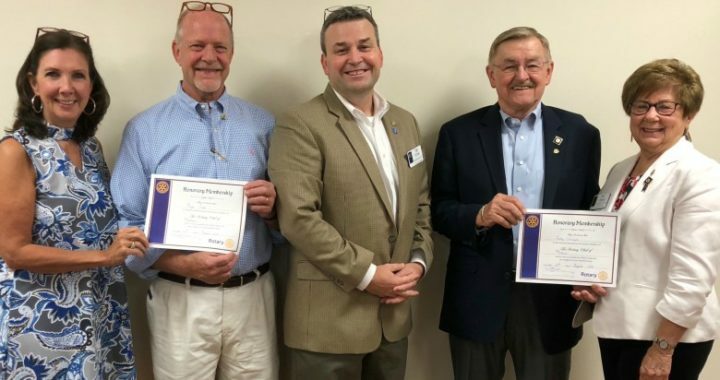 Roger Cross and Tommy Overcash were recently presented with long-overdue Honorary Rotarian certificates. We were proud to acknowledge the years of service and dedication by the husbands of two of our members, Pat Cross and Debbie Overcash. While their names might not be on the official roster, Roger and Tommy have been part of our Rotary Family for many years. We thank them for their service and friendship. Pictured above, l. to r., are: Debbie Overcash, Tommy Overcash, President Tim Stone, Roger Cross, and PDG Pat Cross. ← Baseball Road Trip: Cleveland!